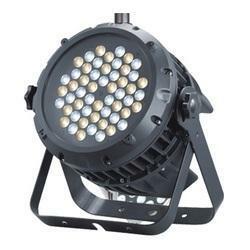 We are a leading Exporter of 36x3w led par rgb ip65, 54x3w led par bi color, 36x3w led par rgb 3 in 1, 54x3w led par 3200k, 54x3w led par rgbw and 54x3w led par bi color ip65 from Mangalore, India. 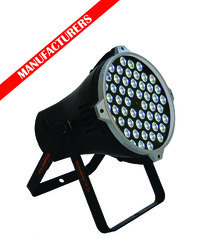 High-quality Canara LED PAR RGBW Light used as an Effect Light, Spot Light, and Strobe Light etc. High power LED's are able to create accurate bright effects and is more than 30% brighter than any of its kind. 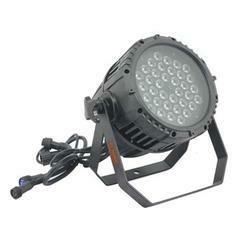 7 Channel DMX-512 fixture having a stable performance with sound active, auto, DMX function. Die cast aluminum housing with black polyester epoxy powder coat. Brightness is controlled by DMX 512 mode through dedicated faders and in manual mode by pressing of tactile switches provided on a light control board. Power loop in/loop out and DMX loop in/ loop out with 3 mt power cables are available. High-quality Canara LED PAR light used as a Key light, Backlight, Fill light, with/without dimming, spot/flood versions for creating many effects for various applications. Die cast aluminium housing with black polyester epoxy powder coat. Brightness is controlled by DMX 512 mode through dedicated faders and in manual mode by pressing of tactile switches provided on light control board. Power loop in/loop out and DMX loop in/ loop out with 3 Mtr power cables are available. Power Supply : 100 - 240V AC, 50 - 60Hz. Accessories (Optional) : C- Clamp, Stand, Safety Bond, DMX and Power cable. 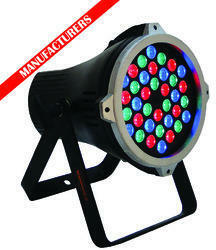 High-quality Canara LED PAR RGB 3 in 1 Light used as an Effect Light, Spot Light, and Strobe Light etc. 6 Channel DMX-512 fixture having a stable performance with sound active, auto, DMX function. Brightness is controlled by DMX 512 mode through dedicated faders and in manual mode by pressing of tactile switches provided on the light control board. Power Supply: 100 - 230V AC, 50 - 60Hz. Accessories (Optional): C- Clamp, Stand, Safety Bond, DMX and Power cable. 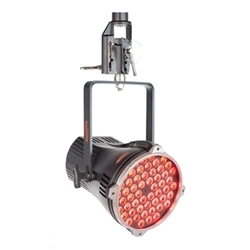 High-quality Canara LED PAR light used as a Key light, Backlight, Fill light with dimming, spot/flood versions for creating many effects for various applications. Power Supply: 100 - 240V AC, 50 - 60Hz. 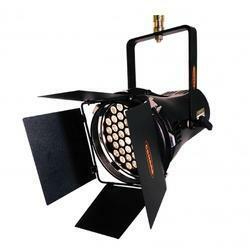 8 Channel DMX-512 fixture having stable performance with sound active, auto, DMX function. High quality Canara LED PAR light used as a Key light, Back light, Fill light, with/without dimming, spot/flood versions for creating many effects for various applications. High-quality Canara LED PAR Bi color IP65 Light used as a outdoor architectural effect light, spot light and strobe light etc. 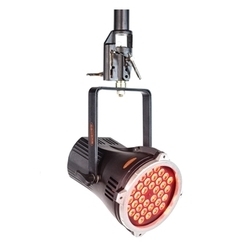 3 Channel DMX-512 fixture having stable performance with sound active, Auto, DMX function. Accessories: C- Clamp, Stand, Safety Bond (Optional) DMX and Power cable. 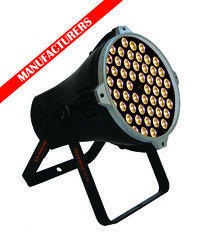 3 in 1 High power LED's are able to create accurate bright effects and is more than 30% brighter than any of its kind. 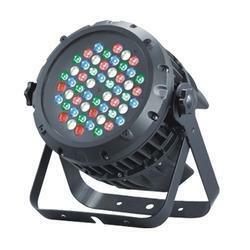 7 Channel DMX-512 fixture having stable performance with sound active, auto, DMX function. Power loop in/loop out and DMX loop in/ loop out with 3mtr power cables are available. 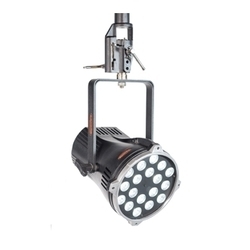 High quality Canara LED PAR RGBW 4 in 1 Light used as a Effect Light, Spot Light and Strobe Light etc. 4 in 1 High power LED's are able to create accurate bright effects and is more than 30% brighter than any of its kind. High-quality Canara LED PAR RGBW IP65 Light used as an outdoor architectural effect light, spot light, and strobe light etc. 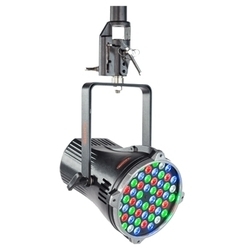 8 Channel DMX-512 fixture having the stable performance with sound active, auto, DMX function.